Kepco's bipolar BOP power supplies are available in 100W, 200W and 400W sizes. For applications requiring higher power, see Kepco's 1KW High Power BOP. For applications requiring higher voltage, Kepco's Series BOP-HV are available in 500V and 1000V models. BOP are high speed power operational amplifiers that can be used to provide dynamically agile voltage for test and simulation. They are not general purpose power supplies. By the nature of the bipolar high speed design, they do not have any energy-storage noise discriminating output capacitors. These power supplies offer ultra low noise and ultra low ripple at the output. Resistive Loads. To realize the full high speed potential of BOP, the load characteristics should be mainly resistive. Inductive Loads. Kepco's 100W, 200W and 400W L option BOP models are optimized for driving inductive loads. This option makes the BOP suitable for a wide variety of applications such as motor testing, testing of magnetic components (coils, speakers, etc. ), industrial applications with inductive loads, driving CRT coils, cryogenic applications and powering correcting magnets for medical imaging applications or particle accelerators. Capacitive Loads. Kepco's 100W, 200W and 400W C option BOP models are optimized for driving capacitive loads. This option makes the BOP suitable for a wide variety of applications such as solar cell/panel testing, driving and testing piezo-electric devices, capacitor testing, driving and testing capacitive transducers, and power for industrial or lab applications with capacitive or capacitive-resistive loads. Operational Amplifier. BOP, while fully rated power supplies, are also high-powered operational amplifiers with full 4-quadrant, bipolar operation. Their output is capable of both sustained d-c and the replication of arbitrary a-c waveforms. In Kepco¹s BOP, the voltage and current outputs can be controlled smoothly and linearly through the entire rated plus and minus ranges, passing smoothly through zero with no polarity switching. BOP E-Series for Ethernet Control. 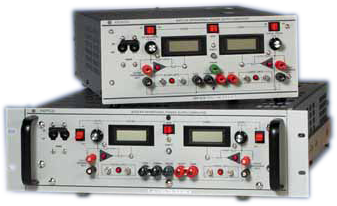 The BOP E-Series is the Ethernet-controlled version of Kepco's BOP bipolar power supplies. All 14 BOP E-Series models offer full control of the bipolar output, either through a web page using a browser, or by using SCPI commands via Telnet. The BOP E-Series employs an interface between the digital data bus and the BOP, accepting the digital input data and converting it to an analog signal, which in turn, controls the BOP output. The BOP E-Series is fully compliant with the SCPI programming language. BOP-E Series is available in versions optimized for inductive loads or capacitive loads. Remote Digital Control. BOP accept BIT plug-in cards for remote digital control; cards may be factory-installed. BIT 4886 provides 16-bit IEEE 488.2 talk-listen control with SCPI support. BIT 802E provides Ethernet control, offering full control of the bipolar output, either through a web page using a browser or by using SCPI commands via Telnet. Dual Channel BOP. Kepco's dual-channel BOP models consists of two 100W Series BOP Power Supplies in a Full Rack case capable of mounting in a standard 19-inch wide rack. The two power supplies are referred to as Channel 1 and Channel 2 within the Dual Channel BOP. The two channels are independent. They have separate input control signals and separate output ports. Remote programming can be configured so that each channel operates independently, or the input control can be connected in parallel so both channels are programmed by the same signal. Connecting the outputs in series or parallel is not recommended; contact Kepco Application Engineering for non-standard applications. BOP are CE Marked per the LVD, EMC and RoHS 2 Directives. See applicable Declaration of Conformity.